Efe Sellu teaches middle school math at St. Louis Park Middle School, MN. Sellu currently teaches math at St. Louis Park Middle School in St. Louis Park, MN, and focuses on creating a classroom environment rooted in community, global-mindedness, and equity. 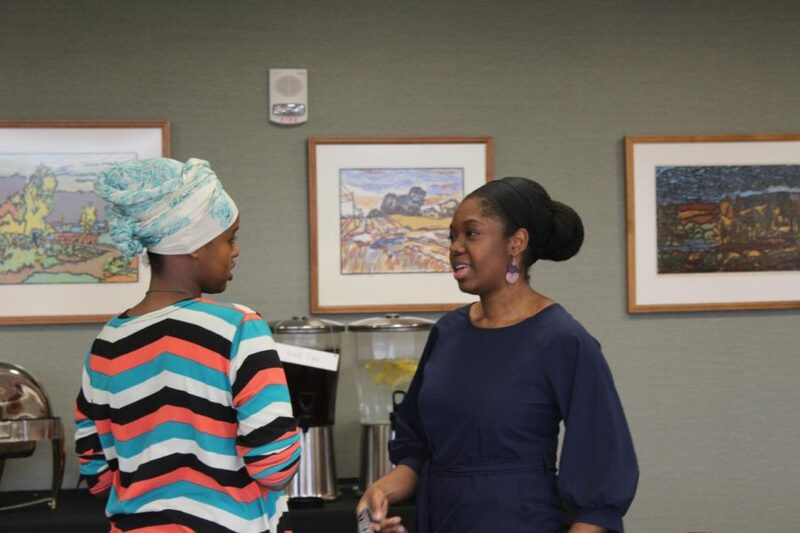 She was invited to speak by the education department in collaboration with several student groups on campus as part of the Black Student Union 50th anniversary celebration that has been ongoing throughout this school year. Assistant Professor of Education Jill Leet-Otley helped organize the event in order to reach out to students outside of the education department by working with organizations such as Black Student Union, International Student Association and Allies, and Beta Theta Omega. 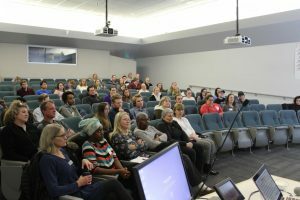 Faculty, staff and students attend Sellu’s talk. According to Leet-Otley, the idea came about late in the summer in a meeting where she heard about the BSU’s 50th Anniversary and felt that the education department should sponsor an event as a part of this celebration. “K-12 education and what we do in [the education program] doesn’t seem to attract students from the global majority, so this was [something we could do] to encourage people who might think, ‘Wow, I could do that,’” Leet-Otley said. The presentation was introduced by elementary education major with a reading endorsement, Warsan Yusuf (‘20). She described Sellu as a “third culture individual,” because she was raised in cultures other than her parents’ due to her having lived in four different countries over the course of her life. Sellu began the presentation with a short timeline of her life. She explained how she began her career in accounting, but after realizing that she was not feeling fulfilled with her work, she went back to school to become an educator. In telling her story, Sellu used a slideshow with flags representing the different countries she has lived in. She encouraged the audience to call out the names of the countries that belonged to each flag, a game she later revealed she uses with her middle schoolers to encourage global-mindedness in the classroom. This was one example she provided of how she tries to engage her students in ways that not only teach math, but create a classroom of culturally informed students who take pride in their diverse community. Warsan Yusuf (‘20) introduces herself during the welcome gathering for Sellu. Sellu described a lesson she had given based on Black Wall Street, which was a community of Black-owned businesses in Oklahoma in the early 1900s that achieved great financial success. The community was eventually bombed in an act of racist terrorism. Sellu used this story as the basis for a unit on positive and negative numbers. English major and secondary education minor, Erik Mandsager (‘20) attended Sellu’s presentation. He enjoyed the presentation’s focus on equity in the classroom, particularly Sellu’s incorporation of the Pacific Educational Group’s compass model for courageous conversations. This model is used to guide interracial conversations about race. Mandsager was also excited to hear from a teacher who shared his interest in culturally responsive pedagogy. 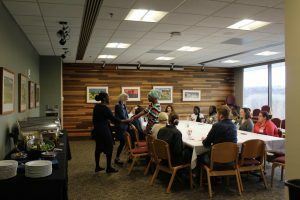 Prior to the presentation, Sellu attended a dinner hosted by the education department and the collaborating organizations, where students had the opportunity to talk to Sellu and ask questions. Leet-Otley viewed Sellu’s visit as a great success.